Water skiing! Rock skiing! Dirt skiing! and yes some snow skiing! 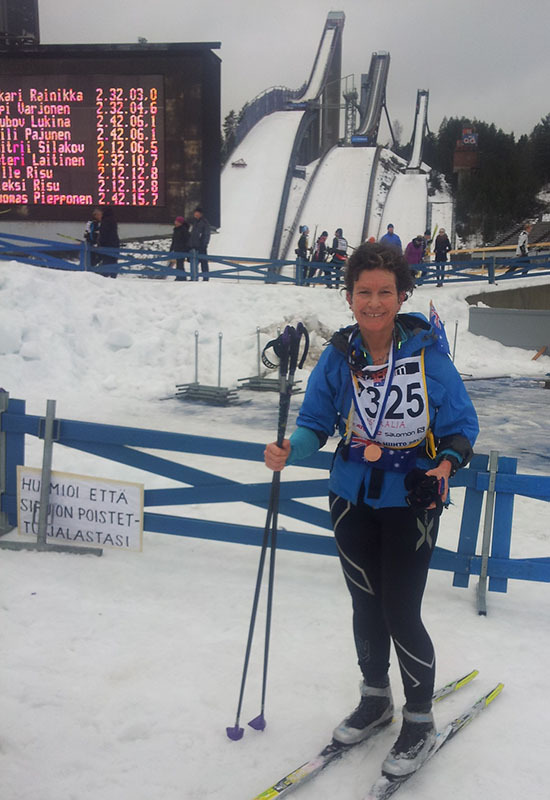 That was the 2014 Finlandia Hiihto Worldloppet race, with a little rain too. The overcast weather shrouded any glimpse of the sun on both days. 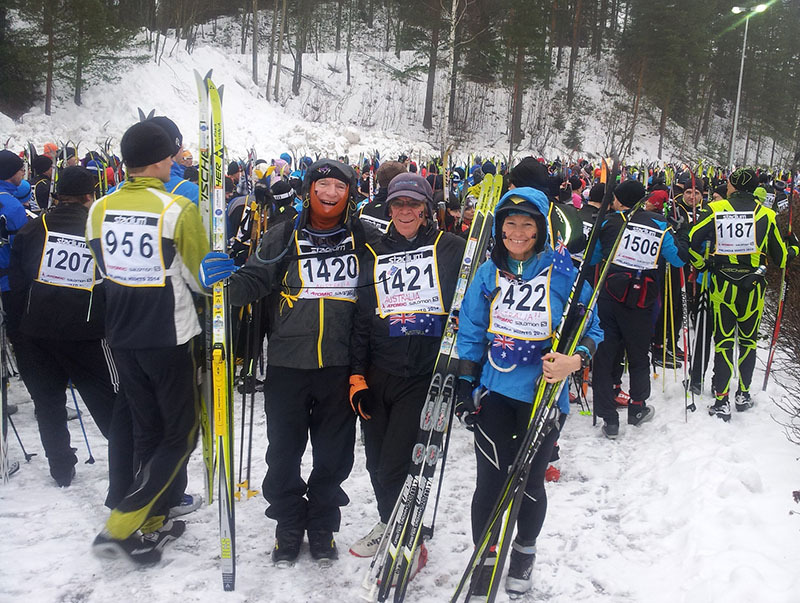 Despite appalling snow conditions the Finlandia Hiihto organisers did an amazing job to hold both the classic and freestyle races all be it on shortened courses; the 50km gold race was reduced to 32km and the shorter silver race was 20km both days. Skiers were extremely keen and enthusiastic, just grateful to have an event after a winter of such warm temperatures and little snow (allegedly the warmest and driest in 50 years). So much snow shovelling and, so much snow farming (particularly across the Messilää swamp) to meet the monumental challenge. On Friday it was a very brisk -5 degrees with rock solid snow on the ungroomed sections, so it was very difficult to believe the wax companies recommendations for yellow (warm above zero) wax for the races, however they were correct. Overnight on Friday there was approximately 3-4cm of fresh snow but by 9am on Saturday the temperature had risen drastically with the falling snow turning to light rain making for challenging conditions for classic skiers grip waxing. Still some 2828 skiers fronted the start line for 4 wave starts for the main classic race. Queuing up, anticipation grew as skiers were keen to be out on the course to experience first-hand the dubious conditions. After the gun blasted skiers crowded in an orderly manner to climb the steep hill out of the stadium past the huge ski jumps. Reaching the top one was able to stride ahead whilst the track was wide. After Tapanilan drink station the track narrowed significantly as the narrower course trail wound its way round and round through the forest. The descent to Messilä was exciting with lots of creamish man-made snow having been trucked in to allow skiers to let their skis run. After the drink station in Messilä the track narrowed again for a steep descent with thin snow. Past the golf course with the short racers veering off the long course, skiers politely took their turns on the narrow steep descents and ascents. By Sunday this section of the course was very thin with skiers having to concentrate constantly to avoid rocks, puddles, and dirt bits all coming through the very thin snow. Many ballerina style acrobats were witnessed as skiers tried their very best to stay upright. On the straight section before Heinsou it was great to feel encouraged by cheering spectators who were especially welcoming to foreigners by displaying flags from many different skiers’ nations including a big Australian flag flying. The snow also improved for the ski towards the drink station at Heinsou, a welcome break for those tired skiers who liked pickles. The drinks were varied, a good temperature and readily available. No surprise scalding or icing of the lips and mouth! Even though conditions were dubious, skiers were very happy the event went ahead especially for those Worldloppet skiers who have already had 2 Worldloppet races cancelled this winter thus far. Kiitos to the organisers and volunteers for doing a superb job in difficult conditions. Well done to all participants as we will remember that first big climb out of the stadium, those tricky glazed sections that looked more like road base than ice, those enthusiastic food station volunteers, the big water pond on the right hand side after Messilä, those hidden rocks in the middle of the track later in the course, the vegetation on the snow surface and …where was the chocolate?! There were quite a few Worldloppet masters skiing at the Finlandia including: Hannes Larson, Boris Petroff, Mark Raderstorf, Lauri Jortikka, Bruce Wharrie and myself. 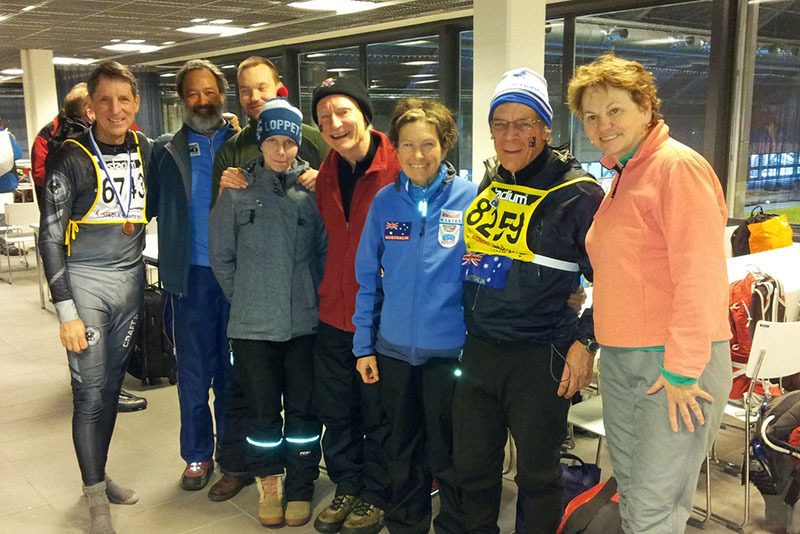 After Saturday’s classic race Bruce Wharrie became a four time gold Worldloppet master and I completed my fifth. This is an even more amazing achievement for Bruce when you learn that he has Multiple Sclerosis and currently his legs are very wobbly necessitating him to walk down some of the hills. Superb achievement Bruce!